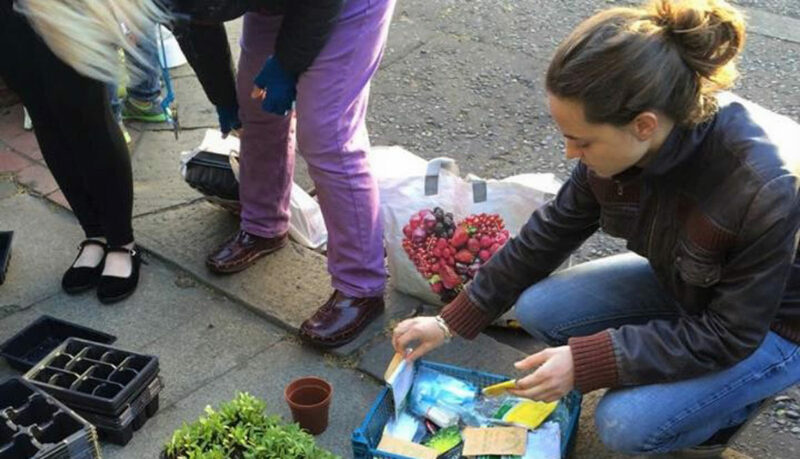 Arthur’s Hill resident Berta Matilló describes the enduring appeal of Vertical Veg, which holds regular free street sessions in different locations in the area, encouraging local people to grow their own food in small spaces. Now in its fourth year, Vertical Veg is still enticing residents of the Wingrove area to get their hands dirty, and get growing. The last event took place in Stanton Street and its theme was ‘Love Your Greens’. It was a session focused on lettuce and leafy crops. There’s a wide variety to be explored and not a lot of it is available in the shops. Lettuce can be purple too; you can add flowers to your salads, you can use chard, kale or rocket and the list is endless. It’s time to get creative and set the iceberg aside. The sun was shining but unfortunately not on that side of the street. Still, it was a lovely evening. As usual, Mark started the session asking everyone to introduce themselves and to say what their favourite salad was. We also shared the benefits of growing salad at home. The joy of just stepping out the front or the back to cut a few leaves for that evening’s salad is something indescribable. In today’s uncertain food industry, knowing exactly what’s on your plate is not easy, so growing your own seems the way forward. We then went onto the ‘technical’ stuff, if it can be called that: how to sow, what kind of containers to use and we were also shown some lovely illustrations on how to harvest our leafy crops. Salad is fairly easy to grow as it doesn’t need a lot of sun – three or four hours a day would be enough. It grows fast and doesn’t need the containers to be that deep. Some varieties can be grown all year round and let’s not forget, it is a very nutritious and healthy meal. After all the theory, it was time to get our hands on the soil and choose from the variety of seeds that Mark had brought. It was nice to see some new faces in the group and hopefully Vertical Veg will continue to engage more residents of the community to start growing. Once you start, you won’t stop. There are further Vertical Veg sessions lined up over the summer. The next is 6 June, 6pm, followed by one on 27 June. Check our events page for details on these, and others.